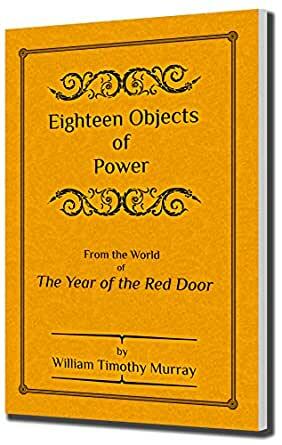 Taken from the Author's notes, this book contains eighteen short descriptions and stories about eighteen magical objects pertaining to the world of The Year of the Red Door. Readers of The Year of the Red Door will be familiar with a few of the things that are described herein. But others, such as the Unerring Arrow of Kalsabahyoud, the Flying Rug of Zan, and the Red Feather of Callowain, are not mentioned at all. Some of the items described, such as the Storm Bag and the Glowing Stone of Bazradur are alluded to or hinted at in only a tangential way, but are not identified within The Year of the Red Door. Astute readers will no doubt understand a few things about The Year of the Red Door that would not otherwise be mentioned therein. Certain "mysteries" within this work are explained, if not resolved, within the pages of The Year of the Red Door. Just as answers to one or two mysteries within The Year of the Red Door might be explained. I therefore offer this excerpt from The Reader's Companion as an entertaining aside, filling in some of the minor details of the world of The Year of the Red Door. So, although not necessary to illuminate the reader's way through The Year of the Red Door, I offer this just as a travel guide might point at something a bit off the path, a vista or feature of the landscape. But, most of all, I hope that you find a bit of enjoyment or pleasant distraction within these pages.